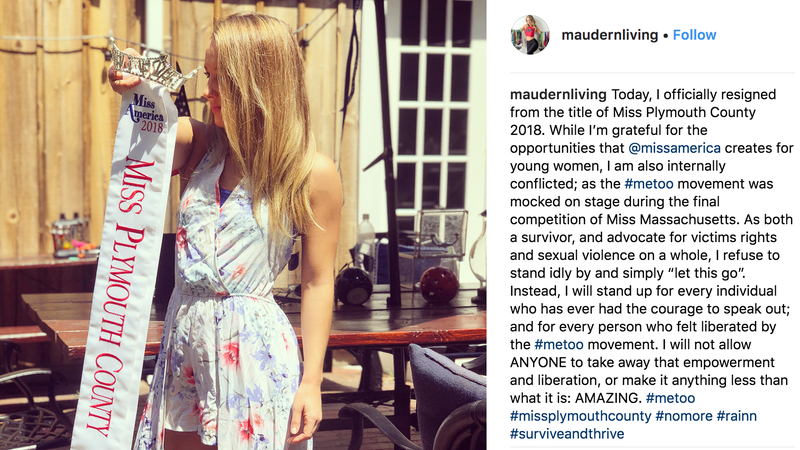 A contestant in this year’s Miss Massachusetts competition has resigned from her title, citing a skit in the pageant’s final round that mocked the #MeToo movement. According to CNN, Maude Gorman, who was awarded the title of this year’s Miss Plymouth County, has decided to hand in her sash following the tasteless skit. Gorman told CNN she was gang raped by three men when she was 13, and felt she could not in good faith continue on with her title. “I instantly knew I had to do something. It was going to eat away at me if I didn’t,” she said. The skit, which was first reported by the Observer, made fun of the Miss America Organization’s decision earlier this year to drop the swimsuit competition. Per the Observer, the skit featured a woman kneeling on a chair onstage, who wailed, “We may have very well seen the last ever swimsuit competition on stage. It’s very upsetting. And I’m trying to understand, God, why it happened.” Then, a person dressed as God and holding a sign reading “#MeToo,” appeared. “Me too, Amy,” fake-God said. “Personally, I can’t see myself being a part of the Miss America organization,” she added. Gorman told CNN she and the other contestants were backstage when they overheard the sketch. “[W]e were all shocked. We said, ‘Oh my god. I cannot believe that just happened. Did that just really happen?” she said. The Massachusetts Board of Directors put out a statement shortly after the skit, offering their “sincere and heartfelt apology for those offended by Saturday night’s skit,” and claiming the skit had not been in the competition’s script and had not been authorized by the board.